Similar to my previous Vintage Candle Wrap, I’ve started with Creamy Caramel Base Cardstock, rolled with Soft Suede Ink and my Very Vintage Stampin Around Wheel (love it!). The mid strip of card is Kraft stamped with Playful Petals and swished with my Aqua Painter (Water only to distress the image). I’ve punched a heart with the Full Heart Punch and embossed it with my Polkadot Embossing Folder and Big Shot. “Mum” is die cut again using the Big Shot and my Junior Timeless Alphabet set. Both are in Bravo Burgundy Cardstock. 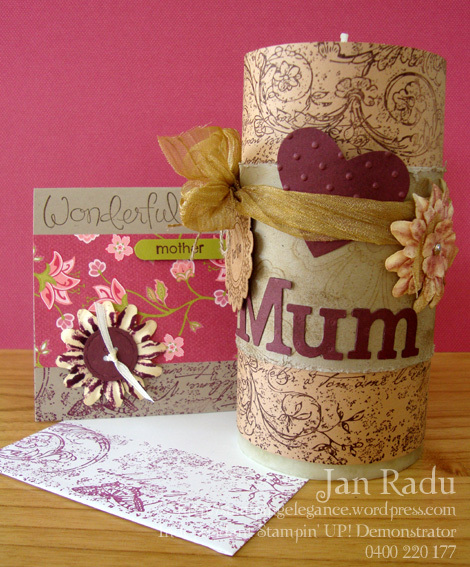 The Flower and Ribbon are Non-SU – the flowers have been coloured using my Stampin’ Pastels and applicator. Kraft Cardstock, Rich Razzleberry Ink – and Raspberry Tart DSP blend beautifully to create this colour scheme. 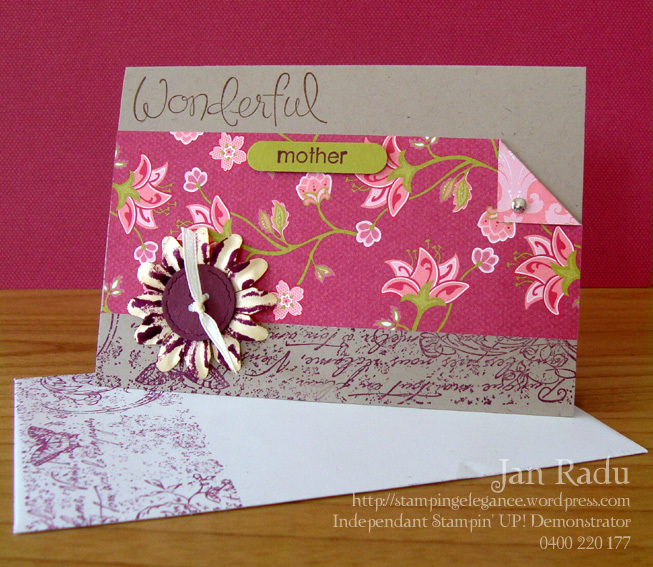 I love using my Wonderful Favourites sentiment stampset – perfect here with “Mother” punched on a Word Window on Kiwi Kiss. I’ve inked up my Paper Flower with Rich Razzleberry just by laying it onto the stampad and pressing lightly onto each petal. The Button is part of the symbol set that comes with the Junior Timeless Alphabet Die Set. I’ve used Bravo Burgundy Cardstock for this hightlight. Don’t you love stamping the envelope as the last touch to a creation? Posted in 3D Projects, Cards, Very Vintage, Wonderful Favourites	| Tagged 3D Projects, Candle Wrap, Mother's Day, Soft Suede, Stampin' Pastels, Stampin' UP! 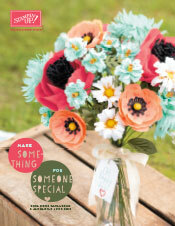 Love your gorgeous Mother’s Day projects! 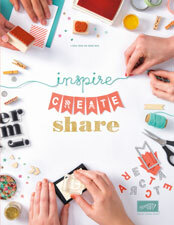 So excited to see your stamping area feature on Just Add Ink! Congrats!! Very exciting! !